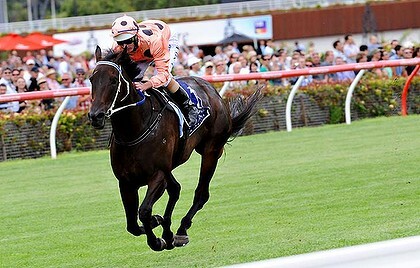 You may have read previously that Black Caviar had been the horse to watch at the Royal Ascot Diamond Jubilee Stakes. Well, though America didn’t ‘have another‘, England celebrated the monumental 22nd win for the Australian mare. The 6 year-old is now ranked 2nd behind Queen Anne Stakes winner Frankel, who amazed fans by winning by 11 lengths. Though it has been discovered recently that the mare hand endured some serious injuries after her win, sources have confirmed the mare will be resting and well-treated until she is race-ready again. Frankel. currently ranked as the top racing mare in the world. She doesn’t just look fast, she IS fast. Image courtesy of Bet365.